As a world leader in material handling equipment for drum and barrel handling applications, Liftomatic Material Handling Inc. provides safe, scalable, efficient, and ergonomic solutions for chemical and petroleum producers, blenders, and distribution enterprises. 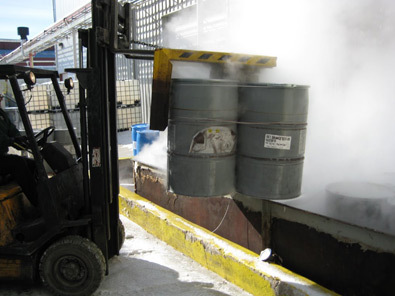 We furnish equipment that covers the transportation and handling of drums containing abrasive and hazardous materials during manufacturing, dispensing, packaging, and storage. 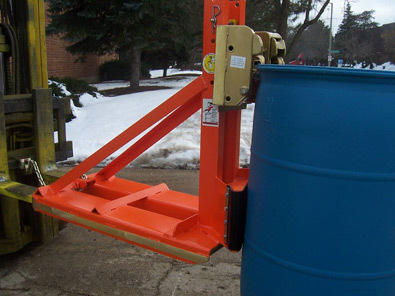 Our performance-oriented solutions incorporate a complete line of portable devices, forklift mounted drum handlers, and hoist/crane attachments for handling one to eight drums and barrels at a time. 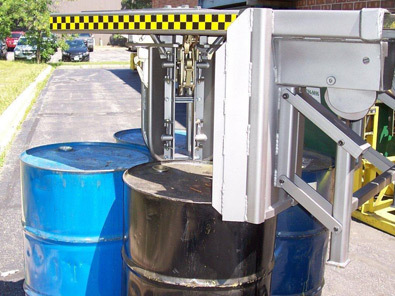 We offer both production models and custom manufactured equipment with built-in safety features for use in Class 1, Division 1 hazardous locations. Spark-resistant and other specialty coatings prevent ignition of flammable gasses or vapors, which provides a safe, OSHA-compliant working environment, everywhere from the processing line to the warehouse, shipping and receiving area. As part of our specialized services, we offer on-site ROI consulting so we can observe your entire drum handling operation and make recommendations. We set up live product demonstrations right inside your plant, which allow you to see first-hand how our products solve all of your drum handling problems. When enterprise customers agree to purchase our products, you can enroll in our Partners1™ corporate pricing program, and we also offer a full range of preventive maintenance services. Our drum handling equipment is used by enterprises all over the world and is currently operating at more than 400 companies on the Fortune 500 list. Contact us for more information; we are available M-F 7 a.m. to 5 p.m. Central Time to answer your questions. Any drum moving, stacking or dispensing application from fill line to storage to shipping and receiving dock. On-site ROI consultation, packaging evaluation and demonstration for you project.